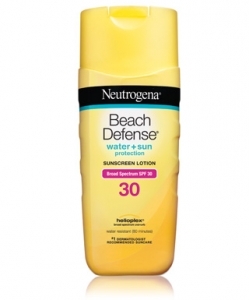 Neutrogena® Beach Defense® Sunscreen Lotion provides superior skin protection from harsh summer elements, clinically proven to help defend the signs of sun damage. Beach Defense® Sunscreen Lotion provides beach strength broad spectrum UVA/UVB sun protection in a lightweight, fast absorbing formula, ideal for outdoor skin protection of the active family. Children under 6 months age: Ask doctor. Avobenzone (2.7%). Homosalate (8%). Octisalate (5%). Octocrylene (3.5%). Oxybenzone (4%). Water, Dimethicone, Potassium Cetyl Phosphate, Benzyl Alcohol, Diethylhexyl 2,6-Naphthalate, Caprylyl Glycol, Silica, Cetyl Dimethicone, Beeswax, PPG-12/SMDI Copolymer, Ethylhexylglycerin, Dimethicone/PEG-10/15 Crosspolymer, Trisiloxane, Ethylhexyl Stearate, Behenyl Alcohol, Sodium Polyacrylate, Trideceth-6, Disodium EDTA, Glyceryl Stearate, PEG-100 Stearate, Xanthan Gum, Chlorphenesin, Fragrance.